an apparatus for furnishing heat or light. 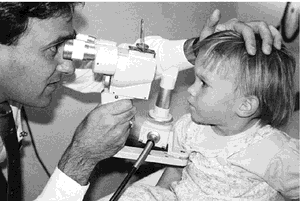 Gullstrand's slit lamp an apparatus for projecting a narrow flat beam of intense light into the eye. See also slit lamp. slit lamp one embodying a diaphragm containing a slitlike opening, by means of which a narrow, flat beam of intense light may be projected into the eye. It gives intense illumination so that microscopic study may be made of the conjunctiva, cornea, iris, lens, and vitreous, the special feature being that it illuminates a section through the substance of these structures. 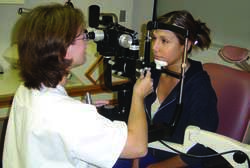 Examiner using hand-held slit lamp. (Photography by Leslie MacKeen.) From Stein et al., 2000.
sun lamp (ultraviolet lamp) an electric light that transmits ultraviolet rays; used as a therapeutic device and as a means of obtaining an artificial suntan. See also ultraviolet therapy. Illuminating device; source of light. (lamp) an apparatus for furnishing heat or light. mercury arc lamp , mercury vapor lamp, quartz lamp one in which the arc is in mercury vapor, enclosed in a quartz burner; used in light therapy; it may be air- or water-cooled. xenon arc lamp one producing light of high intensity in a wide continuum of wavelengths; used with optical filters to simulate solar radiation. Oncology Acronym for Locally Advanced Multimodality Protocol. A clinical trial that compared sequential chemotherapy (paclitaxel and carboplatin) followed by radiation therapy alone with (1) low-dose induction chemotherapy (as above) given weekly followed by concurrent chemoradiation and (2) concurrent chemoradiation regimen followed by consolidation chemotherapy (as above). A device for producing and applying light, heat, radiation, and various forms of radiant energy for the treatment of disease, resolution of impairments, or palliation of pain. A lamp that develops a high temperature, emitting infrared rays; a heat lamp. The rays penetrate only a short distance (5 to 10 mm) into the skin. Its principal effect is to cause heating of the skin. Patients and operators must wear ultraviolet-resistant goggles during treatment. Overexposure to ultraviolet light produces burning and blistering of the skin and may predispose patients to skin cancers. Any device that produces light or heat. Burton lamp Ultraviolet lamp, including some short wavelengths from the visible spectrum (e.g. Wood's light), mounted with a magnifying lens in a rectangular frame. It is used primarily in the evaluation of the fit of a hard contact lens, in conjunction with the instillation of fluorescein into the eye. See staining. filament lamp A lamp in which light is produced by electrically heating a filament, usually of tungsten. The filament is contained in a bulb in which there is either a vacuum or an inert gas. The emitted spectrum is continuous. See continuous spectrum. fluorescent lamp Discharge lamp in which most of the light is emitted by a layer of fluorescent material excited by the ultraviolet radiation from the discharge (CIE). See fluorescence. halogen lamp A tungsten filament lamp in which the glass envelope is made of quartz and is filled with gaseous halogens. This permits a higher filament temperature and consequently provides a higher luminance and a higher colour temperature as well as a longer operating life than a conventional filament lamp of the same input power. 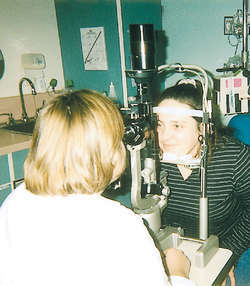 Halogen lamps are used in some ophthalmoscopes and retinoscopes and as very bright sources for people with low vision. Syn. tungsten-halogen lamp. incandescent electric lamp Lamp in which light is produced by means of a body (filament of carbon or metal) heated to incandescence by the passage of an electric current (CIE). See incandescence; luminescence. Macbeth lamp A lamp used in testing colour vision. It contains a powerful tungsten filament bulb with a blue filter of specific absorption properties such that it produces a source of a colour temperature of about 6800 K, thus approximating the spectral characteristics of natural sunlight. 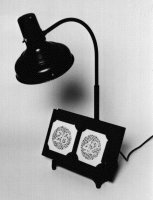 The lamp is also fitted with a stand to hold the colour vision booklet (Fig. L2). Syn. Macbeth illuminant C. See CIE standard illuminants; pseudoisochromatic plates; Farnsworth test.tungsten-halogen l. See lamp, halogen. one embodying a diaphragm containing a slit-like opening, by means of which a narrow, flat beam of intense light may be projected into the eye. It gives intense illumination so that microscopic study may be made of the conjunctiva, cornea, iris, lens and vitreous, the special feature being that it illuminates a section through the substance of these structures. an electric light bulb that transmits ultraviolet rays; used as a therapeutic device. See also ultraviolet therapy. ultraviolet radiation from a mercury vapor source, transmitted through a nickel oxide filter (Wood's filter), which holds back all but a few violet rays and passes ultraviolet wavelengths of about 365 nm; used in diagnosis of fungal infections of the skin and to reveal the presence of porphyrins and fluorescent minerals. she said "I am the innocent cause of our sorrows," and told him of the exchange of the lamp. He then went to the dead magician, took the lamp out of his vest, and bade the genie carry the palace and all in it back to China. He left her and rubbed the lamp, and when the genie appeared commanded him to bring a roc's egg. Madam," replied the slave, "who can help laughing to see an old fool offering to exchange fine new lamps for old ones? According to the report, the global surgical lamps market is projected to grow from US$554. 99 MOROCCAN LAMP Satin nickel Aria table lamp, Satin nickel Aria table lamp, www. Greenstock is able to supply a copy of the independent Certificate of Conformity and Drop Test results, which other shatterproof lamp companies are often unable to do, as some of their lamps are not compliant with the IEC standard. 4 billion in 2017, in part reflecting the rising competition from LEDs that will impact all lamp products. KIRKBURTON - George Street between The Hub and the Memorial Gardens, lamp post number 38 OR the Cricket Field on Riley Lane, lamp post number 10 | KIRKHEATON - Bankfield Lane, lamp post number 8. Currently, the airport has marker lights using a tried-and-true 60-W incandescent T-10 lamp in a cast aluminum fitter with a clear glass lens and a cast aluminum lamp guard.